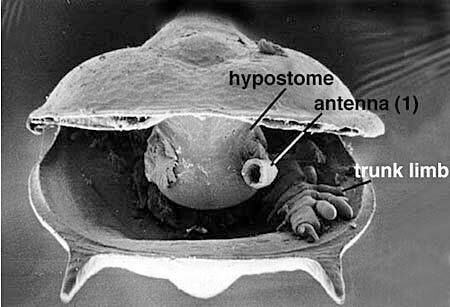 ﻿Note ﻿that ﻿Agnostos ﻿pisiformis ﻿is ﻿different ﻿from ﻿the ﻿rest ﻿of ﻿'Orsten' ﻿arthropods ﻿in ﻿so ﻿far ﻿that ﻿it ﻿has ﻿been ﻿known ﻿for ﻿long ﻿in ﻿form ﻿of ﻿its ﻿calcitic ﻿head ﻿and ﻿tail ﻿shields ﻿of ﻿the ﻿large ﻿specimens. ﻿What ﻿is ﻿still ﻿missing ﻿in ﻿this ﻿list ﻿are ﻿the ﻿cambrogeorginids, ﻿palaeoscolecids ﻿and ﻿more ﻿non-arthropods ﻿and ﻿small ﻿shellies, ﻿which ﻿will ﻿be ﻿added ﻿in ﻿due ﻿course. ﻿You ﻿can ﻿also ﻿download ﻿a ﻿table ﻿of ﻿'Orsten ﻿Taxa ﻿in ﻿PDF ﻿format. ﻿It ﻿will ﻿display ﻿in ﻿a ﻿new ﻿browser ﻿window.